A busy day at Portobello yesterday as this years Regatta got under way. This is only the second year a Regatta has been held in the area for over thirty years. The ‘skiff’ boats were raced yesterday and very exciting they were as teams rowed out around a triangle course and then back to the cheering crowds waiting on the beach. 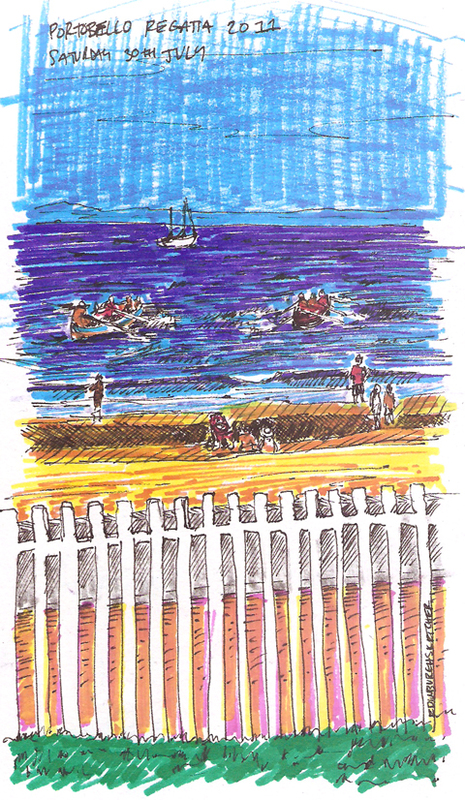 The sun was strong and my family and I enjoyed a picnic on the grass behind the beach, from where the sketch was drawn. Today the sun looks set to shine on the coast once more, and there is plenty to see as a wide range of boats will head out into the water. There are also cake stalls, musicians, and beach races to keep you entertained. So head down to the coast for a great day on the beach.